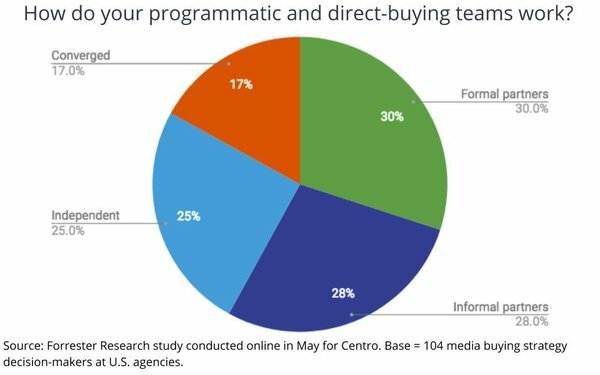 A decade after agencies established independent “trading desks” and/or separate programmatic media-buying teams, most agencies have integrated their programmatic and direct media-buying teams -- either explicitly or implicitly -- according to media-buying strategists at U.S. agencies surveyed last month by Forrester Research for media-buying technology platform Centro. Most media-buying organizations fall somewhere in-between, working either as formal (30%) or informal (28%) partnerships. To facilitate convergence, most respondents (81%) cited technological or (80%) personnel changes, vs. establishing new processes (72%) or changing their business culture (62%). 1 comment about "Agencies Say Programmatic Has Been Re-Integrated With Conventional Media-Buying Groups". Ed Papazian from Media Dynamics Inc, June 28, 2018 at 7:44 a.m.
Joe, what this probably means---where it applies--is that the digital people now report to the same exec as the traditional media folks---not that the two are necessarily integrated with either team able to handle the other medium.